October comes around, and the non profits are making their first of several strong pitches for another discretionary dollar donation. I find my mailbox full, and refreshingly, with some new twists. Kudos to the team at St. Joseph’s Indian School who have brought in some new creative to overlay their basic control kit. St Joe’s gift vouchers go full color. The Dream Catcher is the most unique gift of all. As always, the Dream Catcher is a unique keeper. I have several, which make their way to the grandchildren. But the kits also deliver more colorful coupons. We’ll see if they repeat…or does the sterile, sober-looking appeal still trump happy colors? As yet, St Joseph’s is not twigging to my male gender: I am getting stunningly beautiful foil labels with flowers and butterflies. I can’t use these, not even on my golf clubs. The Post-It Note goes pointy for more attention. Another St. Joseph first for me: a pointy Post-It note. It’s a little different, and catches my eye. Certificates, suitable for framing deliver a message. Plus, I have received a colorful, feather-imaged gold foil, embossed certificate of appreciation, on laid stock, no less! 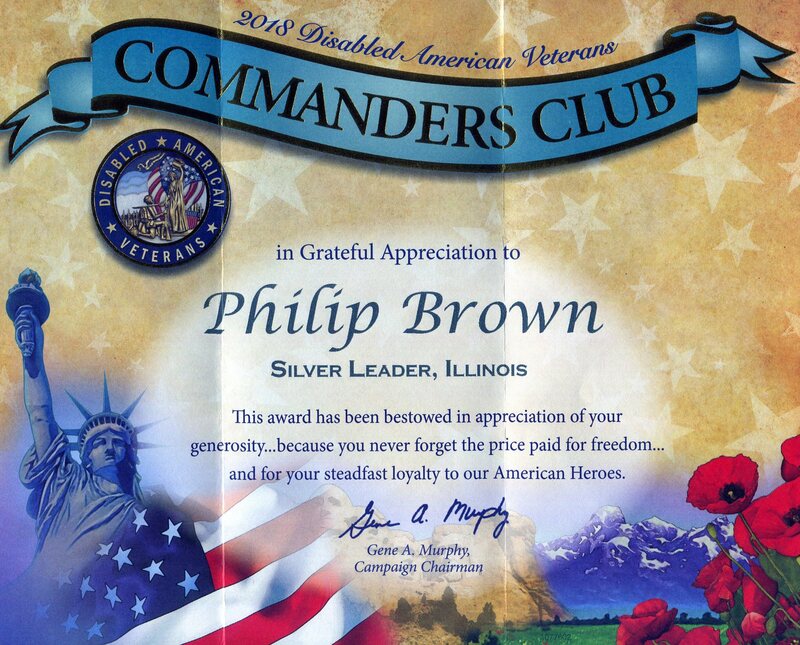 Veterans of Foreign Wars sent me a similar recognition. These certificates really are quite classy, as ‘thank you’s go. I am not going to frame them, but that doesn’t mean that someone somewhere else won’t frame theirs. VFW targets the CD-player crowd with Christmas carols. 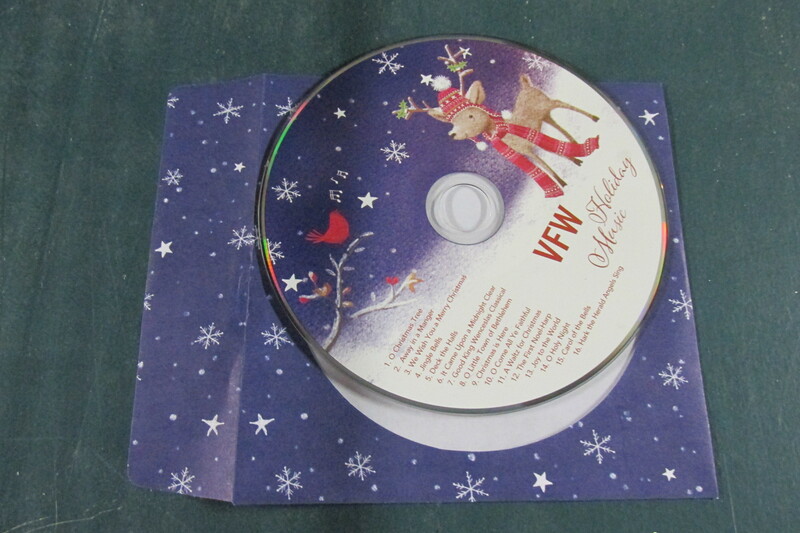 VFW also sent along a CD of Christmas carols! This may seem early to you, but actually is just in the nick of time: our new car no longer has a CD drive, but hey, it’s the thought that counts. I do have a cassette player in the basement, a.k.a., Santa’s Workshop. Father Flanagan’s Boystown has sent me a Puzzles and Brainteasers booklet. You know, I mean to give it to the kids, but in an idle moment, I look at them too. 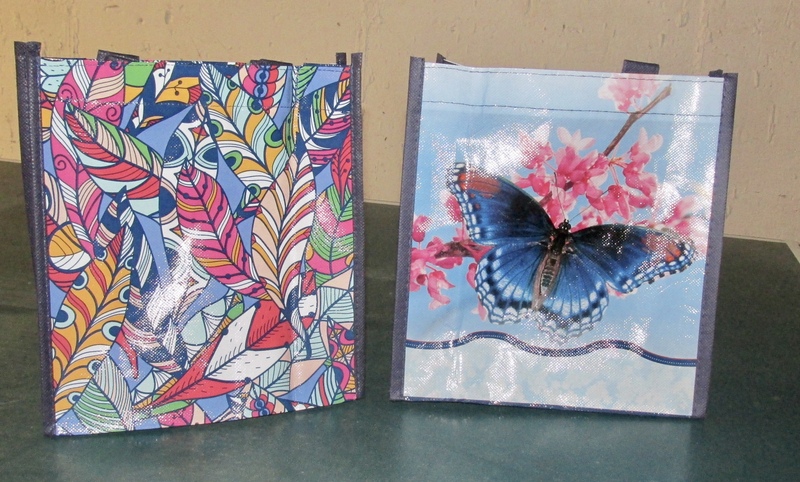 Beautifully designed gift bags are the pride of several organizations. In an additional kit I was also treated to a colorful paper gift bag. These items show up across several charities, and I suspect there is a traveling paper bag sales rep who is shipping bunches of orders back to a printing plant in Shenzhen China. 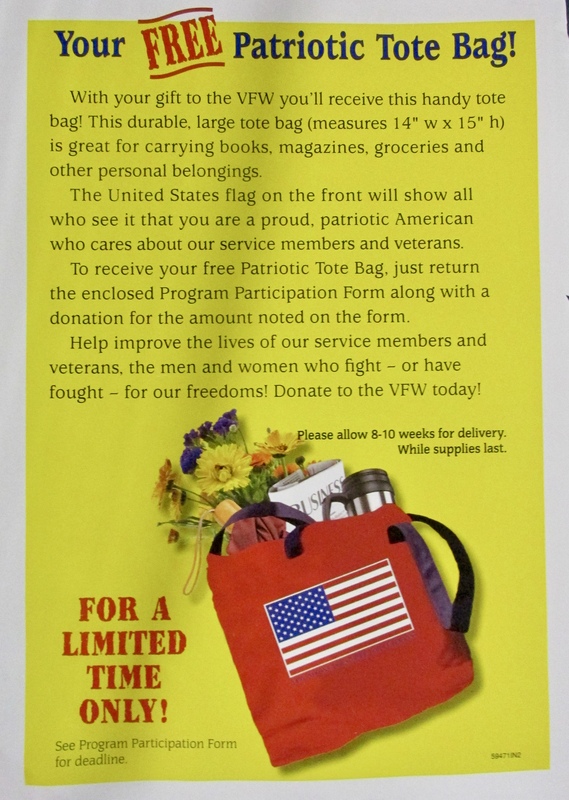 The tote bag is a premium-with-donation offer from VFW. Veterans of Foreign Wars has kicked the bag up a notch. 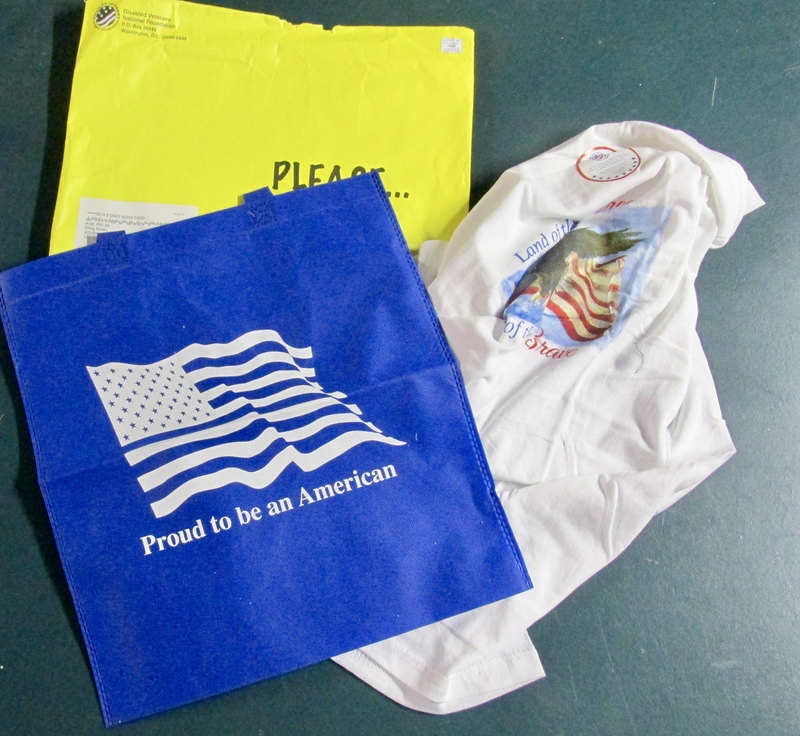 They offer a full-sized tote as a premium with donation. DVNF throws in the bag and a T-shirt with their request for donation. At the top of the pile however is Disabled Veterans National Foundation (not to be confused with Disabled American Veterans) which sent the whole bag, and a T-shirt, in a day-glo yellow max-sized envelope. I am now thinking that there are regular flights for printing sales personnel from U.S. to Shenzhen. St. Joseph’s vinyl totes are small, but classy. Truly, the most impressive were printed plastic vinyl tote bags courtesy of St. Joseph’s, that aside from their modest size, sported quality designs. 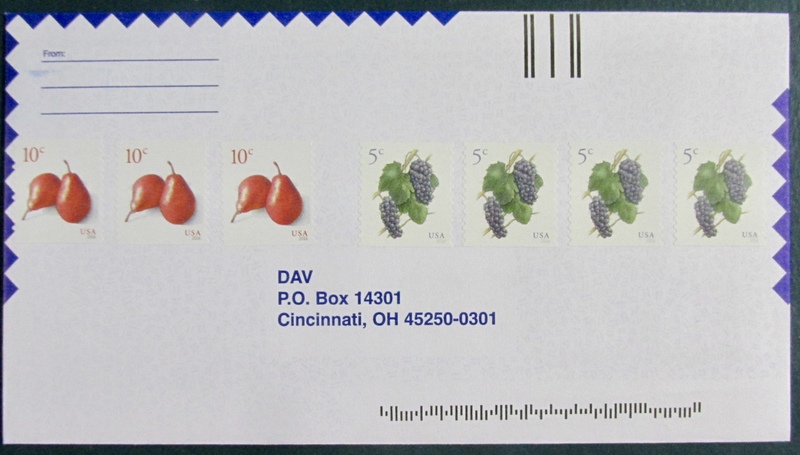 There is an artful expansion of thinking on applying postage stamps to the reply envelope. Pasting real postage on a reply envelope is a riveting issue. 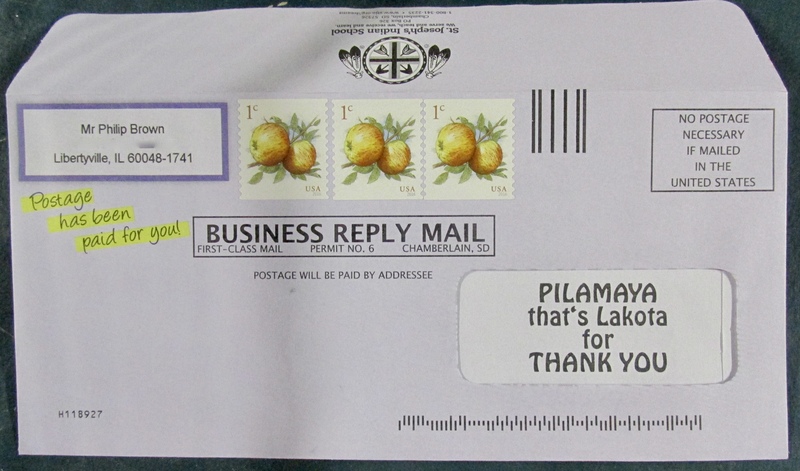 Donors shudder to waste the stamps, and I am sure the charity’s accountants aren’t thrilled about giving away postage. 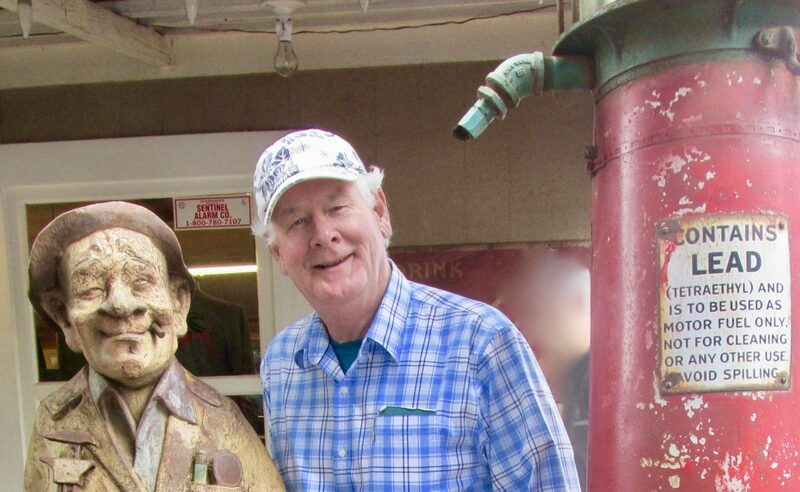 But here’s the thing–you may remember in my book Many Happy Returns, the story of the fundraiser who coaxed the donor to please supply their own stamps. The reply envelope said, “Your stamp will save us money.” In a manner of speaking, it did. Average dollar gifts rose 6%, but response rate dropped 15%. Go figure! DAV fronts all of the postage on the reply envelope..50 cents worth. Anyway, the pioneer in applying the full 49-cents (or so) postage was DAV. They primed the pump, and happily cashed our flood of checks. We Baby Boomer donors can’t see a stamp go to waste. But now, there are some diversions in the path. VFW fronts only 5 cents, but appearances count in their favor. 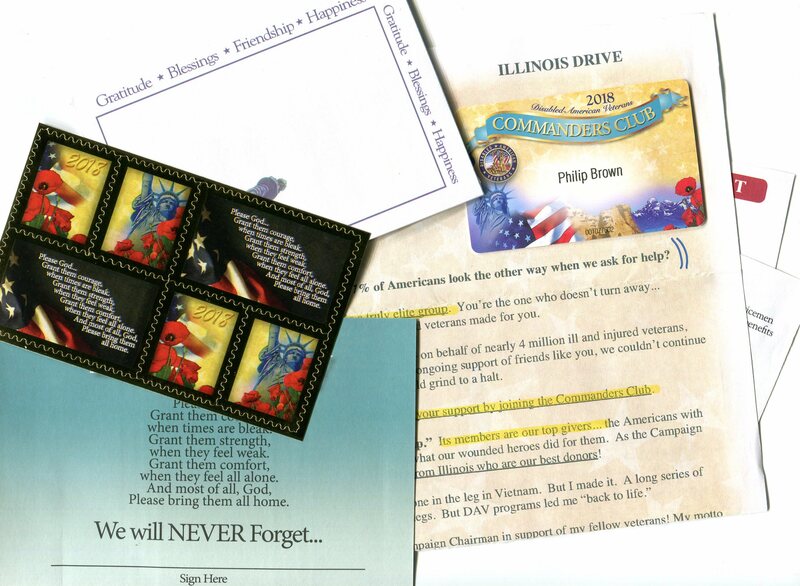 VFW provides 5, one-cent stamps to the postage paid BRE, and the USPS will charge the rest. 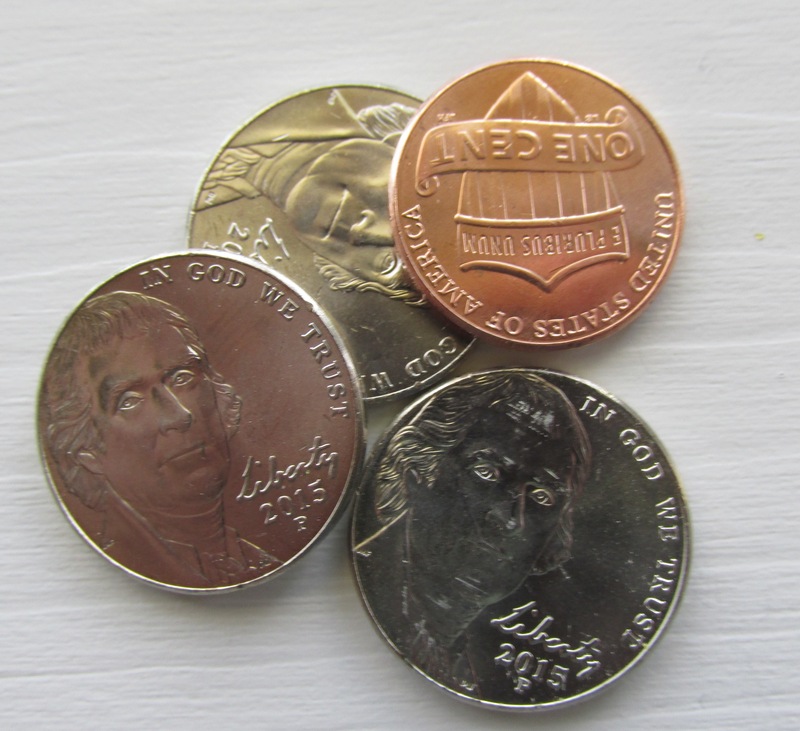 The modest nickel cost looks like a lot of stamps–but it’s not 50 cents’ worth. This effectively cuts VFW’s in-the-mail costs by $450 per thousand, while still appearing to offer the more expensive stamps. St Joes includes a faux return address label with 3-cents postage. St. Joseph’s sharpens their pencil a little more, and only provides 3 one-cent stamps, but adorns their BRE with a faux return address label in my name. How can I throw this out? Boystown decorates their BRE with zero-value greeting stamps, but they look great, regardless. 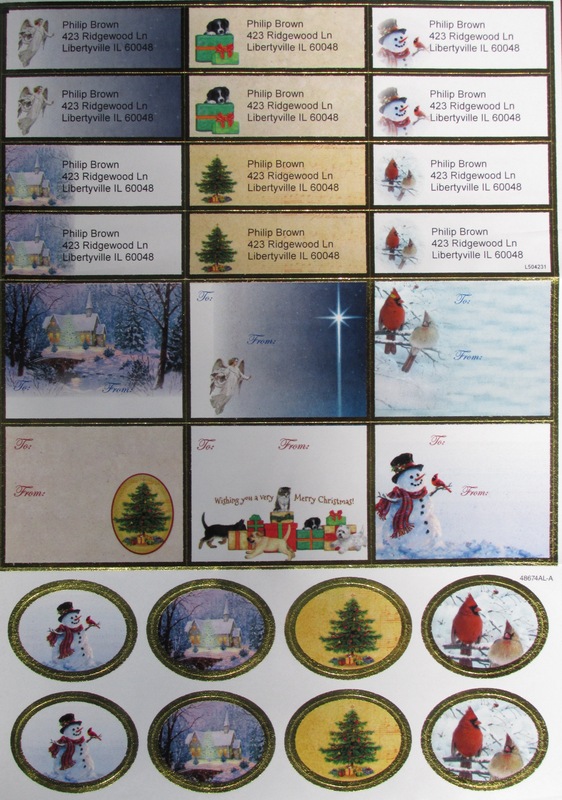 Not to be outdone, Father Flanagan applies 4 Greeting Stamps of no value whatsoever to their BRE, but they look great! Who can deny the effort? 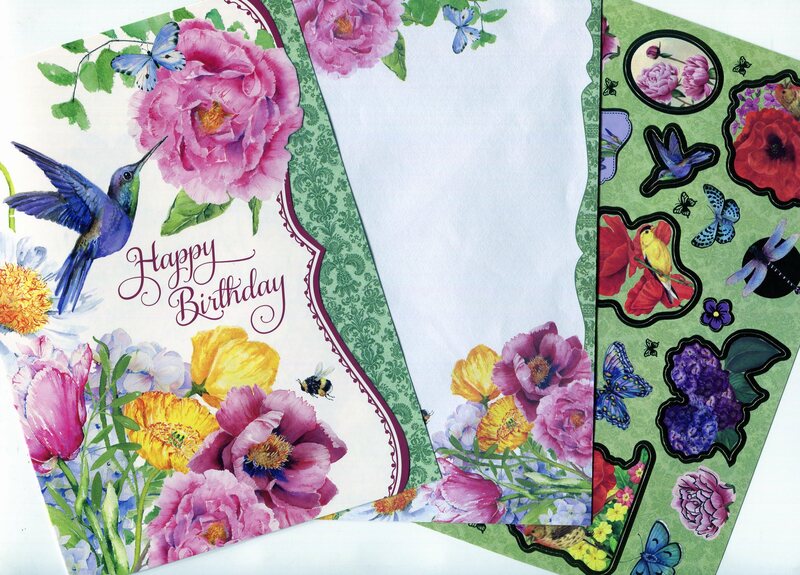 To date we have 46 greeting cards in inventory. Production quality is high. 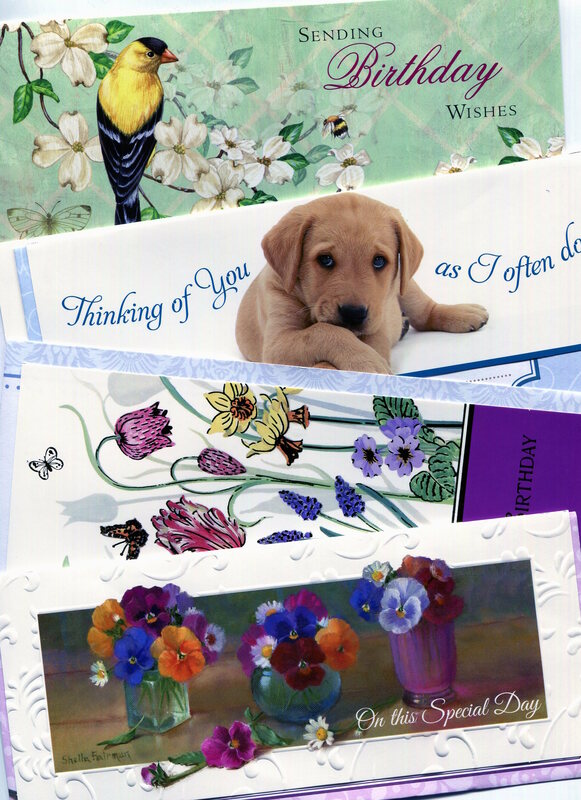 Throughout all of the recent spate of mailings I have received, greeting cards still predominate. I counted 46, all high production quality, and which are now stored in one of those pretty paper gift bags. 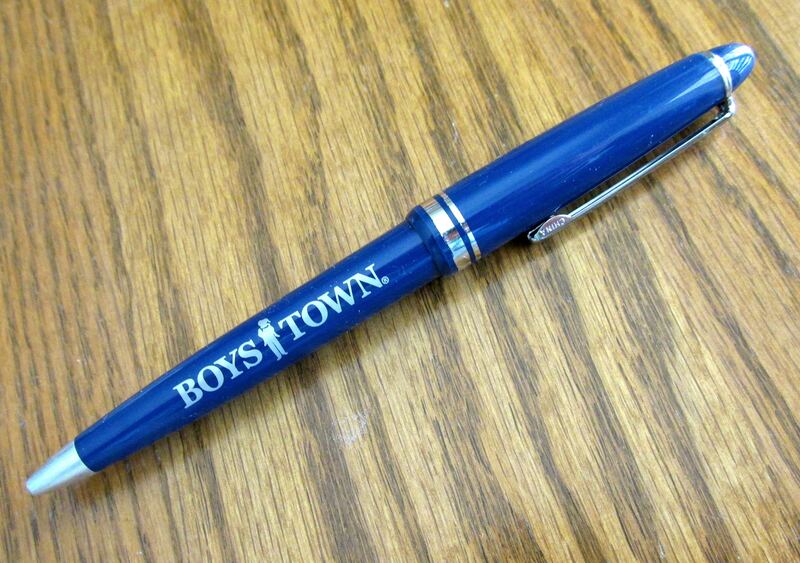 We have a bucket of pens, but St Joe’s are the classiest. 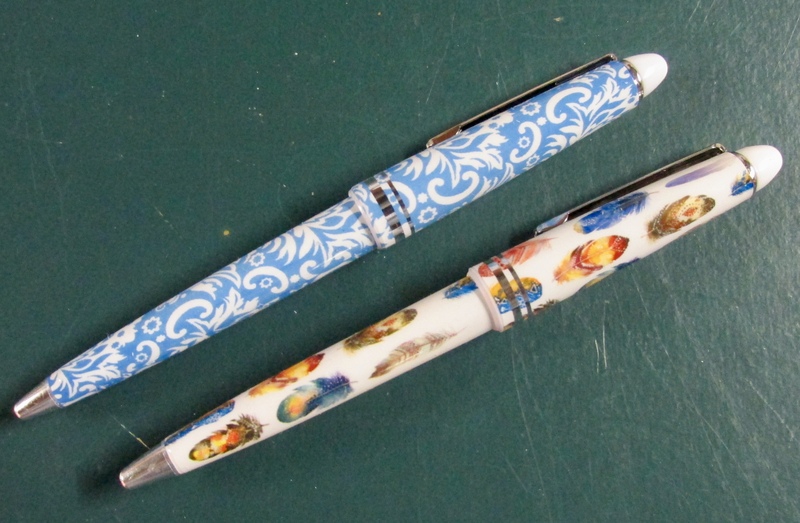 As well, I have been issued with numerous writing pens…lots of them, and some very tastefully designed, courtesy of St. Joseph. And speaking of writing, I have a mountain of note pads, some die-cut, none of which can be discarded. A pencil case for the pens. A lunch box may be next. They get used. And when not, where do they go? Into a pen and pencil bag, supplied by St. Joseph’s! Wow, what’s next…a lunchbox? 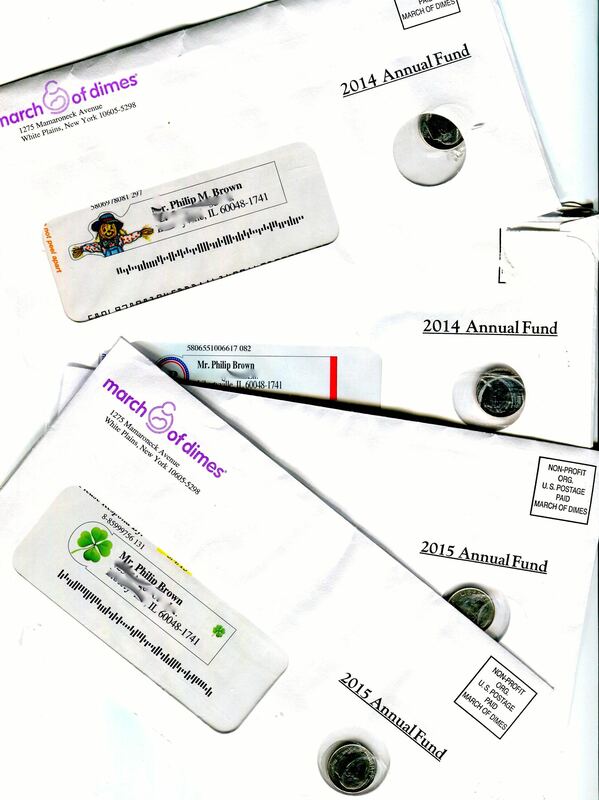 There is an ongoing debate, stirred up by loyal donors about the exorbitant expense taken in these mailing pieces. How can a charitable organization spend this much, and then ask for more money? The fact is, the gift strategy works. Especially if the gifts are exclusive and high quality. When they are accompanied by personal, expressive letters, the efforts are rewarded by donors who are sitting on, or searching, for the summit of Maslow’s pyramid: self actualization. Thanks for reading, and sharing. If you wish to check on these charitable organizations, you can visit Charity Navigator, or the organization’s websites to see their financial disclosures and especially their direct mail fundraising performance. DAV has granted me membership to the Commanders Club. The fundamental logic of customer acquisition mail is like starting my snowblower this morning. Gas up, pull out the choke, prime the cylinder and yank the cord. After a moment’s belch of smoke, I can turn off the choke, and the machine settles into a nice, steady RPM. In direct mail, the sales funnel is a similar process: first overwhelm your prospect, at some expense, then convert them to a repeat with a follow up, and then funnel them into a steady revenue stream. So I have kept track of my personal response funnel with a few regulars. Arbor Day will reforest my yard, many times over. They are looking for a conversion. Last time I wrote, I reported to you that I had giddily responded to their acquisition piece, ordering 10 spruce trees, and 2 lilacs, with the hope of getting a year’s supply of coffee beans. Well, the coffee beans got me, but I didn’t get them. However, I did get a follow-up mailing, profusely thanking me for the spruce and lilac order. 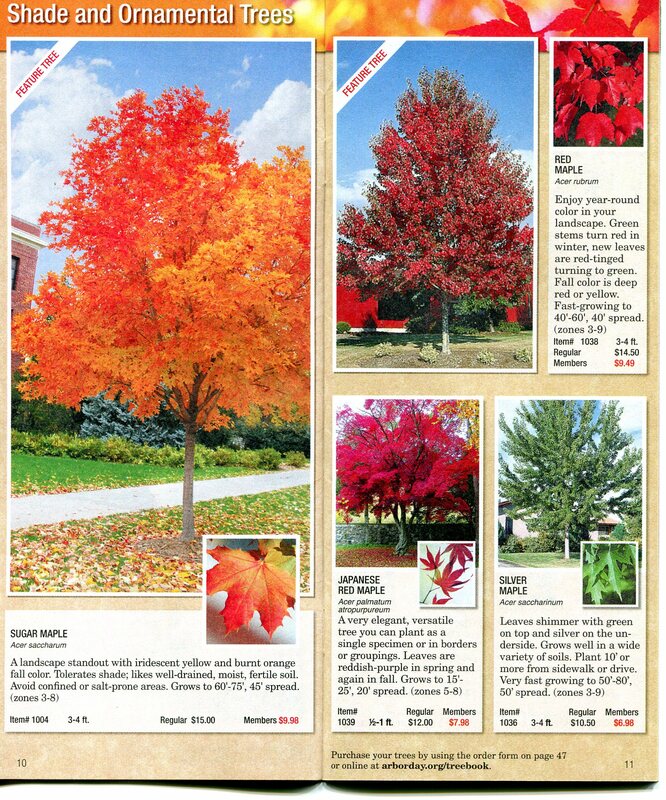 In this mailing they furnish a colorful mail order tree catalog, a newsletter, member card and a free red maple tree with my order. The tree is 3-4 feet high. I haven’t the heart to explain I have 17 trees on the lot now. I am still wondering where to put the spruces and lilacs. Paralyzed Vets sees me bagging my groceries at attention. This should be a win back. 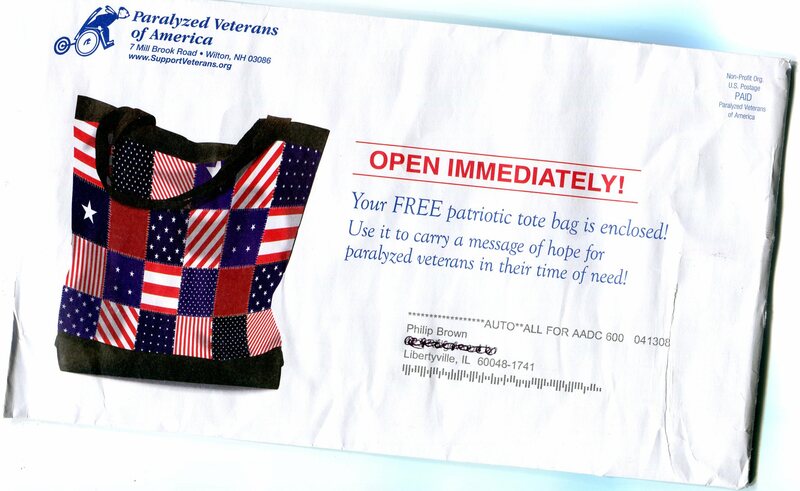 I haven’t responded to them in the last few years, so they are gracing me with a patriotic tote bag. Actually, they have forgotten who I am, or was, and are introducing themselves. This is a gap in their database. The tote is enclosed, shrink-wrapped. American Legion’s zip strip. A lesson here: it tears best when with, not across the grain of the paper envelope. This is a win back, delivered as a questionnaire. It comes in a large orange flat, 10″ x 13″, opens with a ‘zip strip’ and presents a set of rhetorical opinion questions which are, as designed, hard to say ‘no’ to. 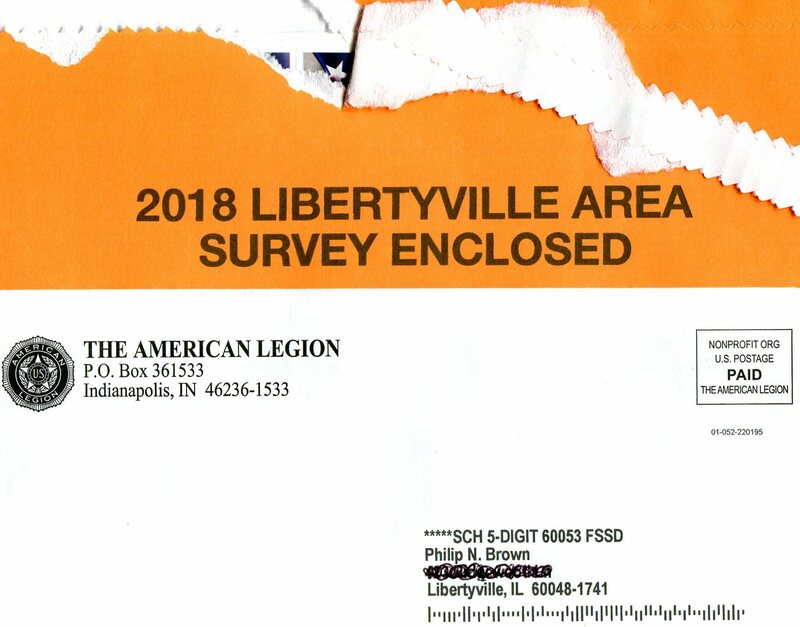 I haven’t given to the Legion in a couple of years. The labels they offer as a freemium unfortunately misspell my name. A modest, business-like presentation from the VFW. The solar calculator works to 7 decimal places. This is a conversion kit, and I am flattered that they have already made me a Gold Circle member. I don’t think I quite deserve that. 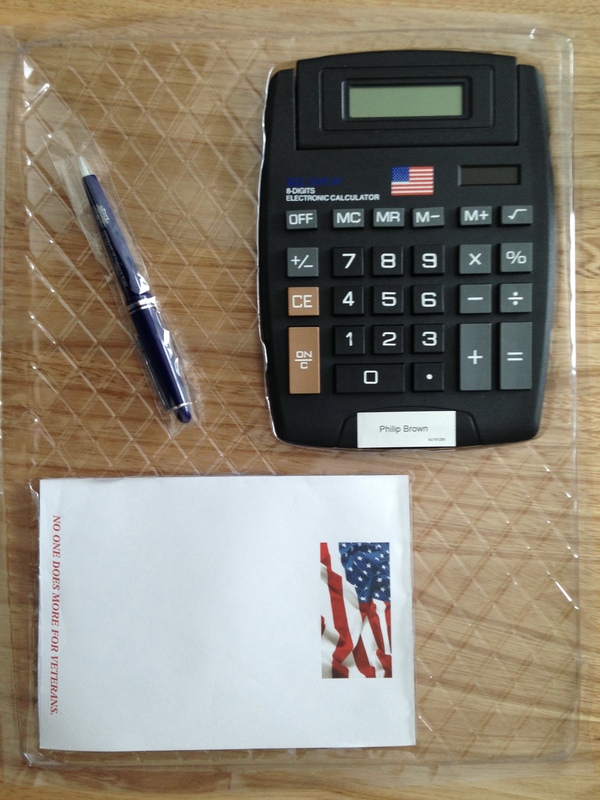 However, they do, and have sent me a 12″ x 14-1/2″ flat containing a monogrammed desktop calculator, pen and notepad. The calculator works, and my traditional test is ‘PI‘, 22/7 = 3.1428571 which goes to the 7th decimal place. With PI, that’s far enough. They optimistically ask our mailman to deliver to our front door. Good luck with that! DVNA equips my office with everything but a lawyer. 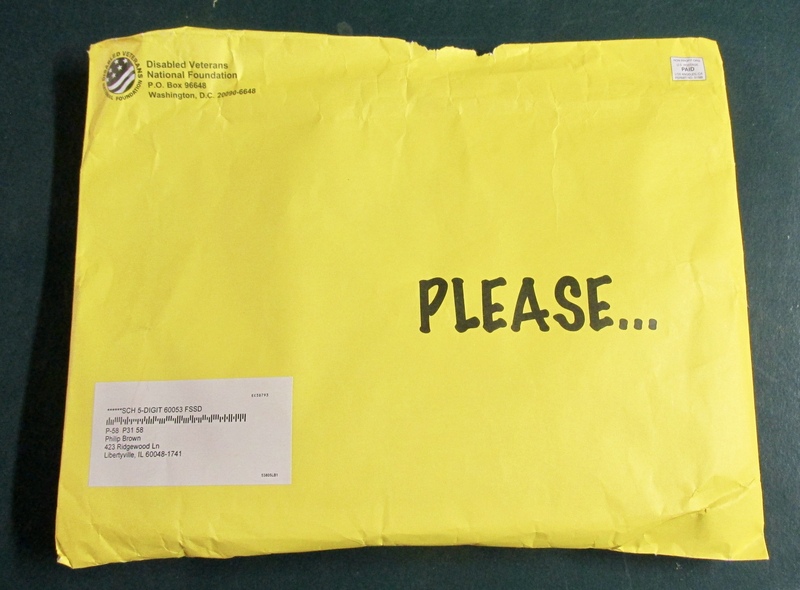 This 12″ x 14-1/2″ faux kraft flat is like a postal trunk sale. It is an acquisition piece. 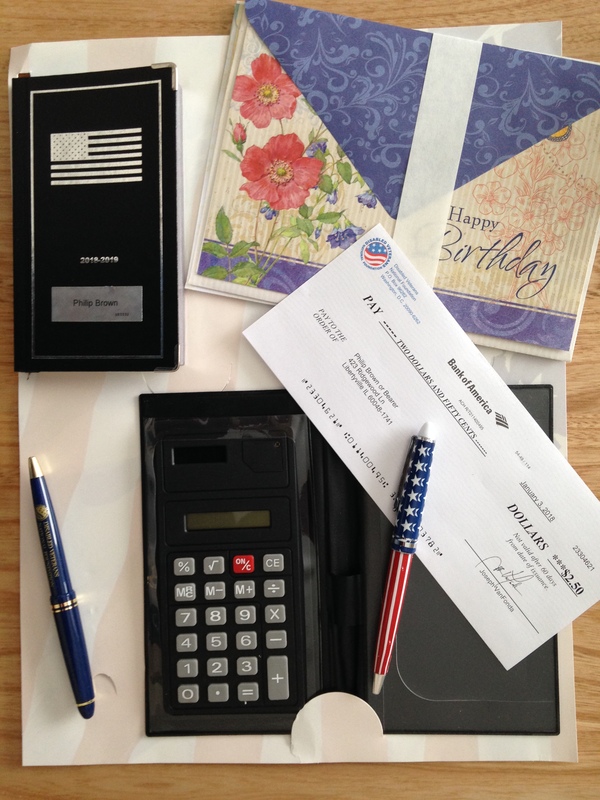 Inside I get the motherlode: a pocket calculator in its own wallet–goes to the 7th decimal place– two pens, a monogrammed 15 month calendar, with silver-edged pages, three greeting cards and envelopes, and a check made out to me drawn on the Bank of America for $2.50. I am verklempt. DAV’s renewal kit bespeaks lower cost. They have me now. This is a renewal notice to the DAV’s Commanders Club. A kraft #9 stuffed with a member card, a small note pad, some tastefully designed stickers, a prayer card, and a certificate stating I am an Illinois Silver member. The preferred ‘ask’ is $50. This kit is confidently on cruise control. 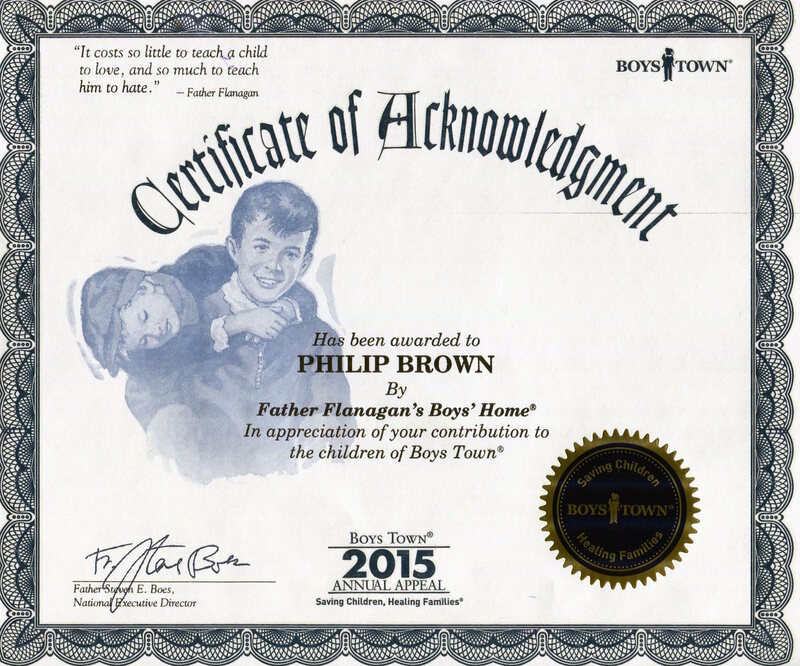 Father Flanagan’s “Acknowledgement”: I envision Spencer Tracy suggesting I try a little harder. This 8-1/2″ x 12″ kit is as thick as a breadboard. It is not an acquisition piece, because I am a repeat donor, so I put it up to their attempts to get a bigger gift from me, like $60. They send along a wall calendar of the cosiest Sam Trimm bird paintings I have ever witnessed, plus a 30-page puzzle book–21 games, answers on the back page–, a pocket calendar, a one-page, at-a-glance calendar, a 16-page daily planner, a Certificate of Acknowledgement–which I don’t want to over analyze, but I think it really means ‘you can do better’– a second 2018 calendar, with a personalized street sign, two sheets of address stickers, and of course, a letter displaying some gift certificates worth $60 that I should fund. My Aunt Betty would have liked these. I did not respond quickly enough to the kit above, so Father Flanagan sent me a 6 x 9 reminder stuffed with blank greeting cards. I should point out to the folks at Boystown that these cards are pretty close to what my sadly belated great aunt would have mailed upon occasion, rest her soul. They have hearts, flowers, birds, and butterflies. Again, I should not over-think this, but it’s possible Father F believes I am my aunt. Lakota designed hosiery. We all need socks. I have difficulty thinking I am not a “renewal” with these folks. But darn it, they are still working me up with a shiny, red-foiled, hard sell on a ‘triple-up’ mailing. An anonymous benefactor will triple my gift. They would like $25 which will balloon to $75. While this is reminiscent of the stock market, up until last Monday, I am even more impressed by the very snazzy pair of socks which they have included for me. Many may have lost their shirt on the Dow Jones this week, but by golly, I have my socks. I have to return to snow blowing. My feet are warm. Arbor Day, The American Legion, Disabled American Veterans, Veterans of Foreign wars, Disabled Veterans National Foundation, Father Flanagan’s, St. Joseph’s Indian School. 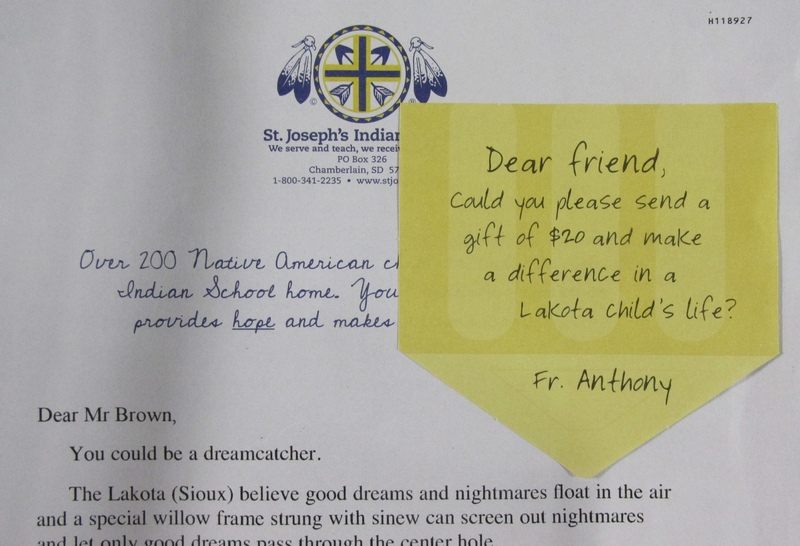 St. Joseph’s Indian School delivers the piece de resistance. You know it’s Fall when the big fundraising kits stuff your mailbox. This year we have a surfeit of gifts from direct mail fundraisers. Father Flanagan’s Boystown stickers for identifying anything that moves. Years ago the pioneers in the business presented us with address stickers. These we have dutifully paid for and have now labeled every moveable item in our home: CDs, iPads, iPods, iPhones, chargers, golf clubs, cassettes, Walkmen, books, staplers, rulers, vinyl… luckily we don’t own a pet. 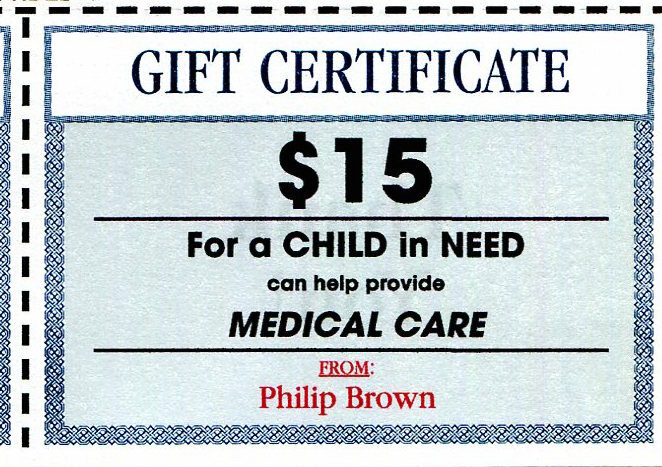 The ante was raised by the March Of Dimes who gratuitously presented us with a small monthly stipend of ten cents: a shiny new dime pasted to a donor form. Food For The Poor’s coins… how can you just pocket them? That munificence has been outpaced by Food For The Poor who made change for the dime, and sends us a penny and a shiny new Jefferson nickel. That’s a 40% cutback, but insertion is more costly, so it’s a wash.
Not to be outdone, Disabled American Vets provides a 9×12 calendar, which we can place beside the 10×20 calendar from Boys Town. Of course, wall calendars are bulky, so we are grateful to St. Joseph’s Indian School which gave us a 4×6 calendar booklet for the purse. I am waiting for the 3×5 that fits in my shirt pocket. 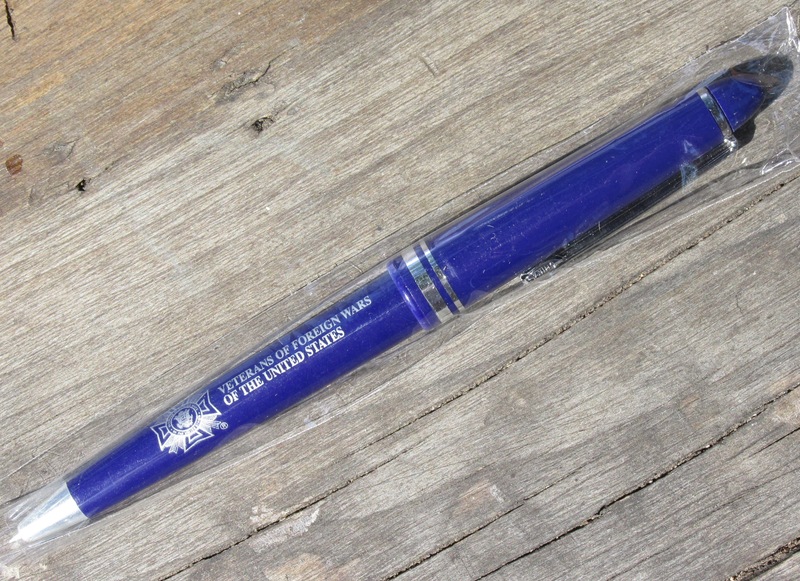 There’s no excuse for not writing….here’s a VFW pen. The mailing industry is of a generous culture though. 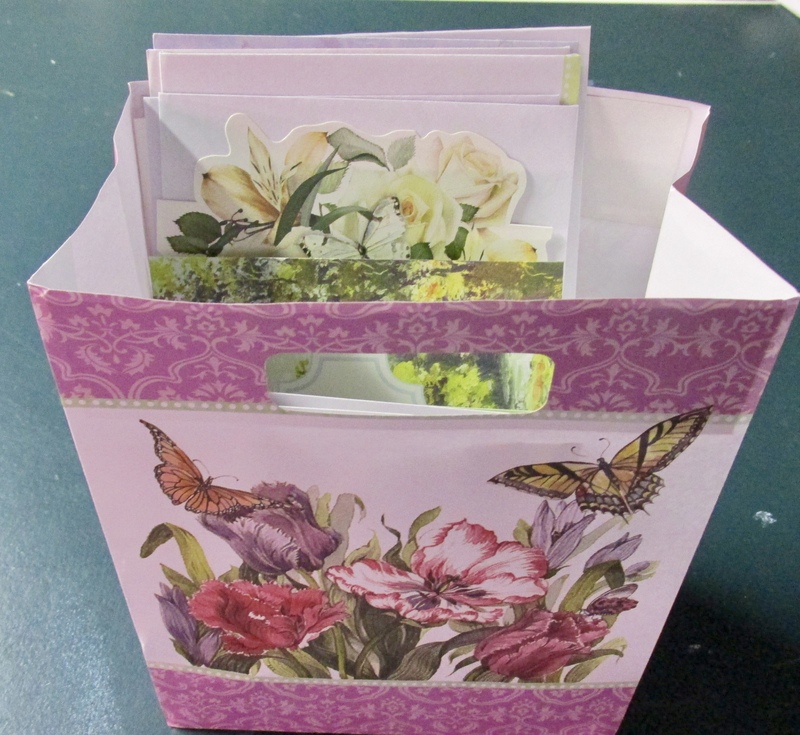 With all these other possessions, we have also received dozens of greeting cards: whole writing kits, with pens, to reach out and greet someone– anyone. 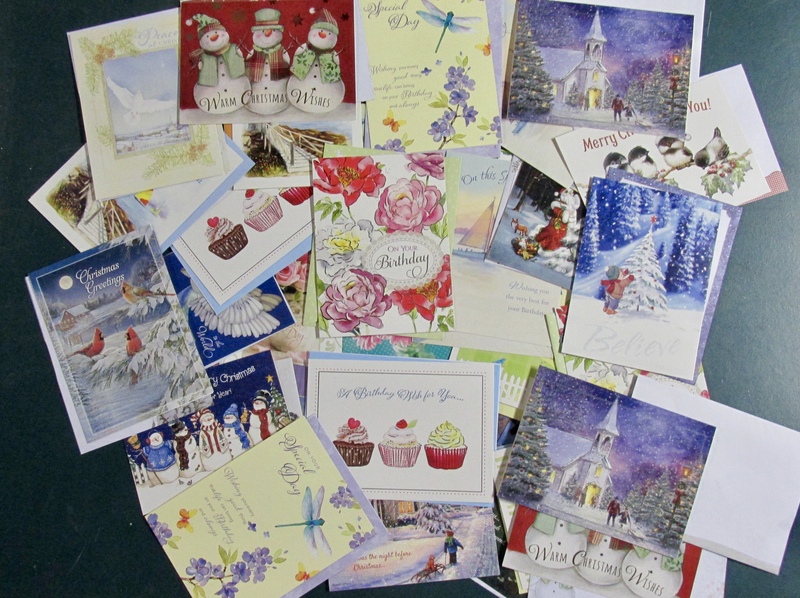 Oblate Missions has sent us so many Christmas cards it may be easier if we send them our Christmas mailing list instead. 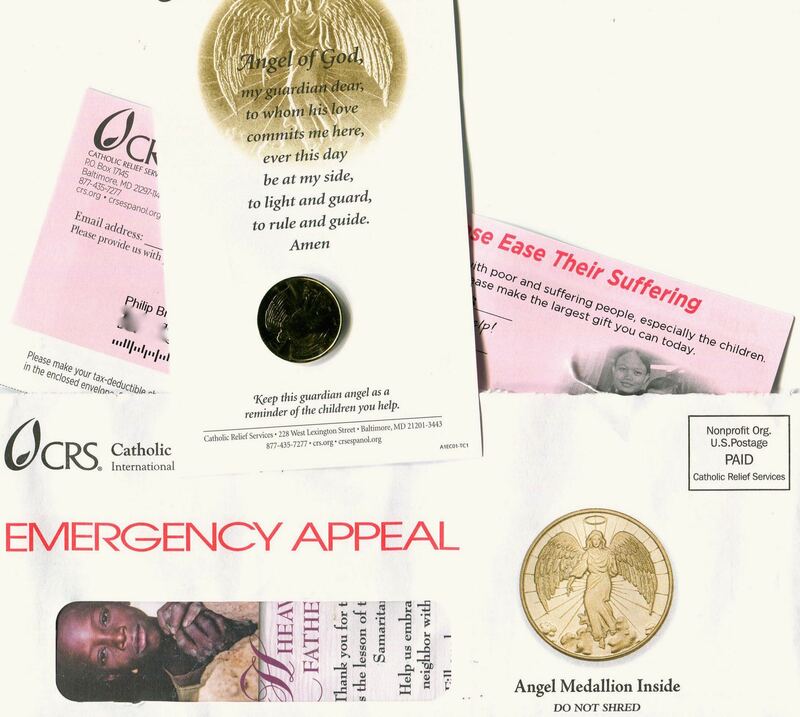 Catholic Relief Services’ prayer medallions. You can’t blame an organization which does its part in reinforcing the goodwill that blossoms from receiving a greeting card in the mail. I am all for it. 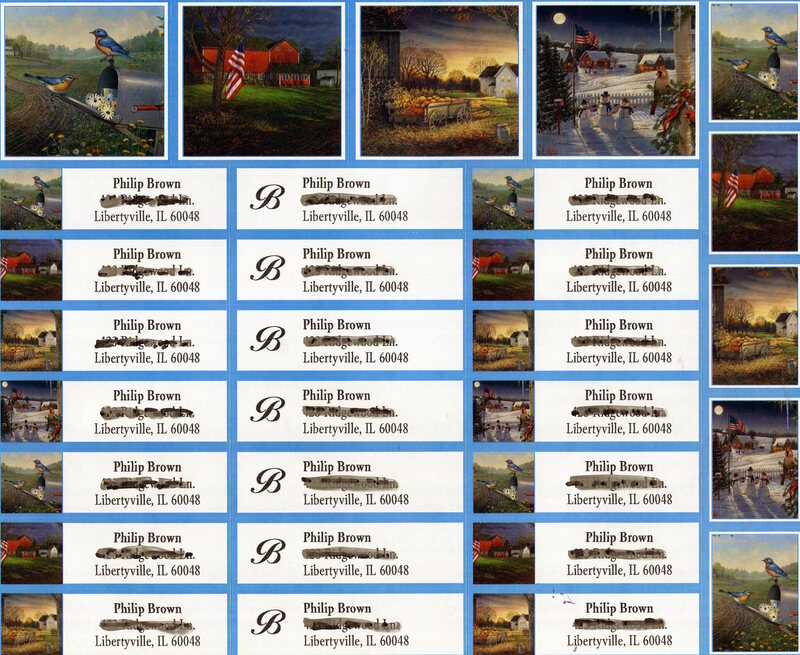 As a sidenote, the USPS post office in Libertyville has a well designed rack of greeting cards for sale. In one of their early bold moves, Disabled American Veterans pasted 45 cents in stamps onto their reply envelopes. Overflowing in confidence that once we saw the postage in place, we would feel obligated to fill the envelope. 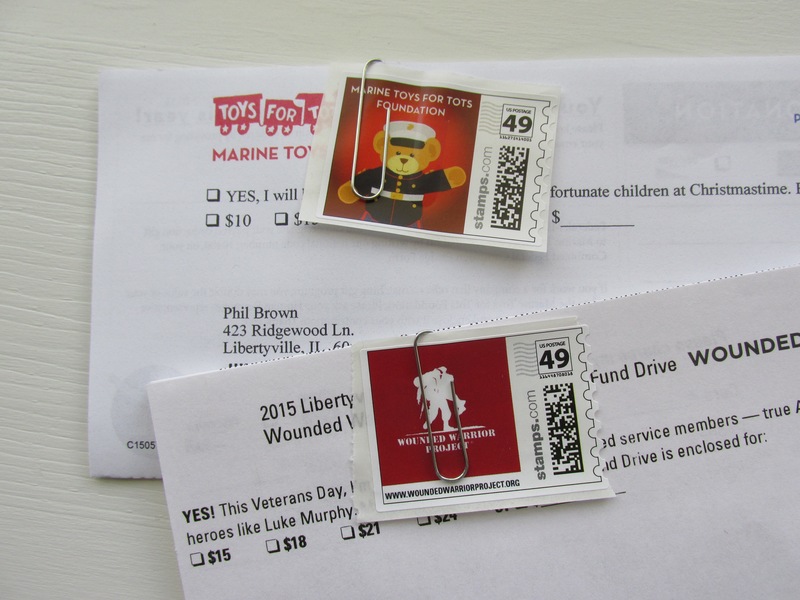 Marines Toys For Tots and Wounded Warriors provide your stamps. Even gutsier, Wounded Warrior Project and Marine Toys For Tots are paper clipping custom 47-cent stamps to their letters. This is very expensive, as Stamps.com provides these stamps at a hefty premium. The strategy works though. Can one really use the stamp for anything other than a gift without a stab of guilt? 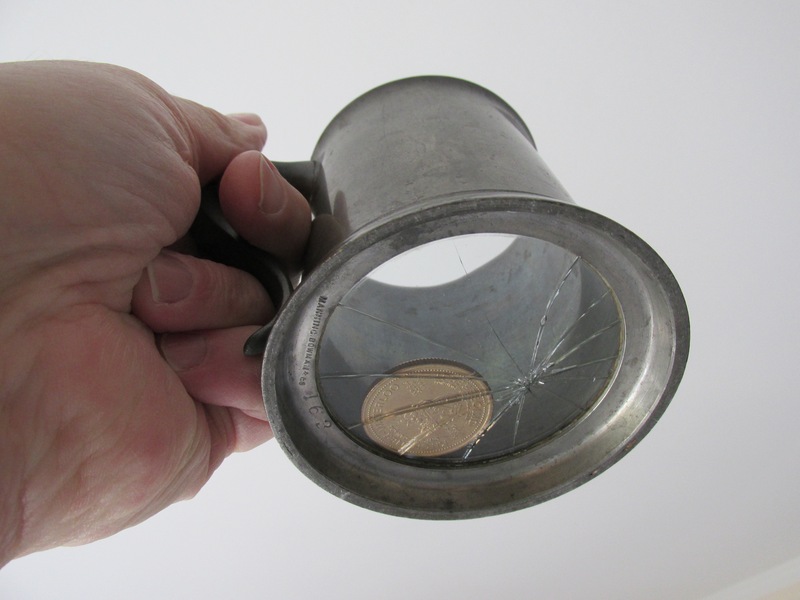 To avoid being pressed into service, British sailors eyed their brew from the bottom up. The gifting brings to mind the old conscription practices of the 1700’s when British sailors were pressed into service when they drank from a tankard of ale, only to find the King’s shilling in the bottom. By unwittingly enjoying the beverage, the sailor had been hired. I think of that clever ploy as I pile up the loot, especially the coins and stamps. The mailers know what they are doing. Despite all common sense, they have proven that the unsolicited gift still wrests outlandish response rates and donations. And once you are hooked, they will be back until they end up in your Will. That’s right. Planned Giving is a part of every established fundraising strategy, and if you asked, many organizations can tell you which of their huge bequests started with a direct mail gift, years before. Fleece gloves… probably a postal nightmare, but still handy. 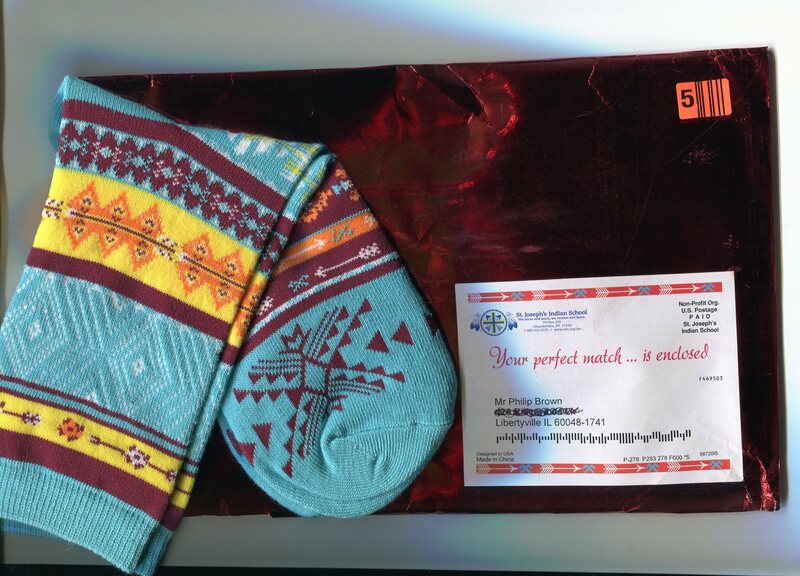 This season’s most impressive packages included one from Kids Wish Network, which sent along a pair of fleece gloves. They arrived in a lumpy wrinkled paper envelope I am sure that the post office would rate as “baggage class”. But how do you throw those out? 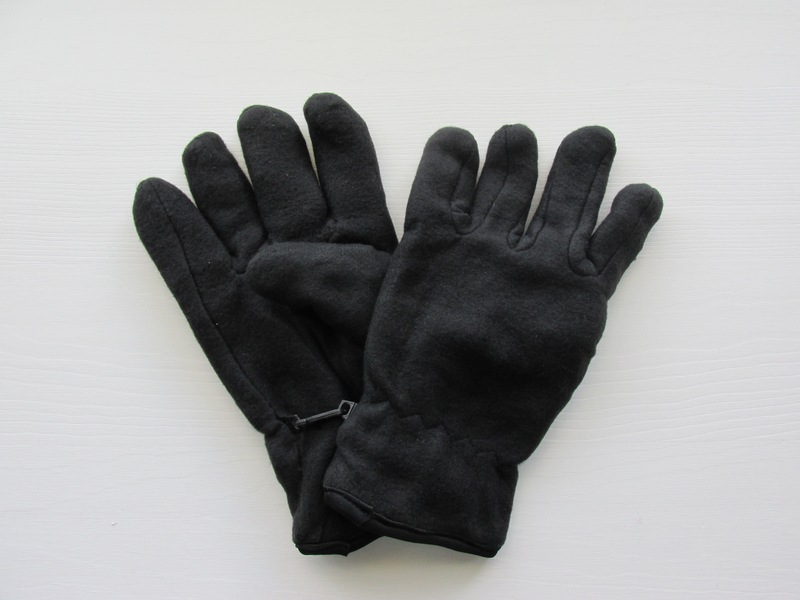 What tight fisted non-donor could wear them, especially when the writer suggests: “When you use the deluxe fleece gloves I sent you, I hope you you’ll remember Wish Kids like Tabitha…” . 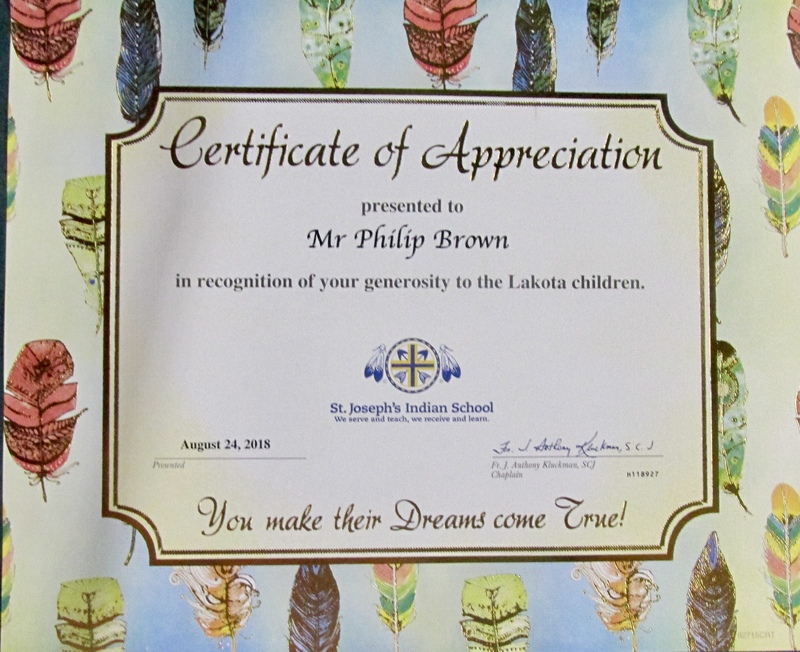 The penultimate delivery however, the cream of the crop, the ne plus ultra, is the bulging envelope from St. Joseph’s Indian School. No doubt USPS rated this one as “duffel bag class”. 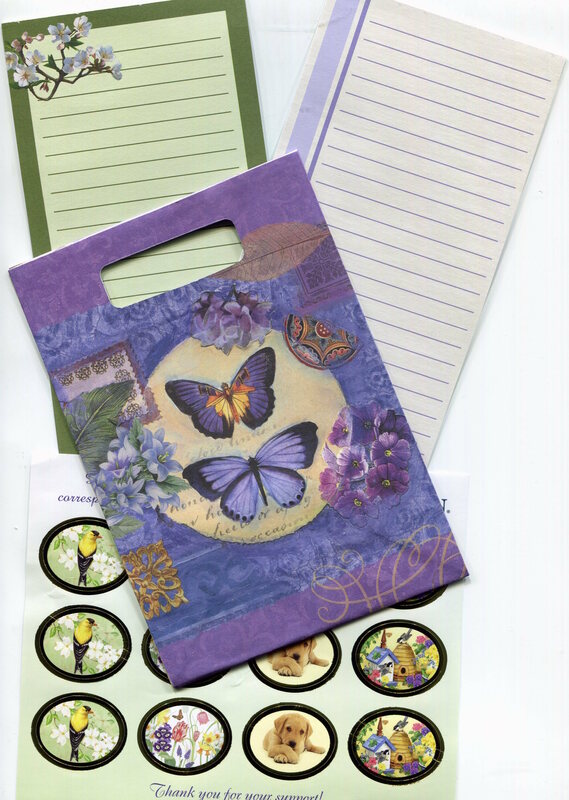 Inside we found the usual and generous complement of address labels, gift stickers, 4×5 note pad, 5×7 note pad, pocket calendar, wall calendar, personalized calendar card, and 3 shrink wrapped greeting cards. St. Joe’s mystical Dream Catcher, not to be ignored. 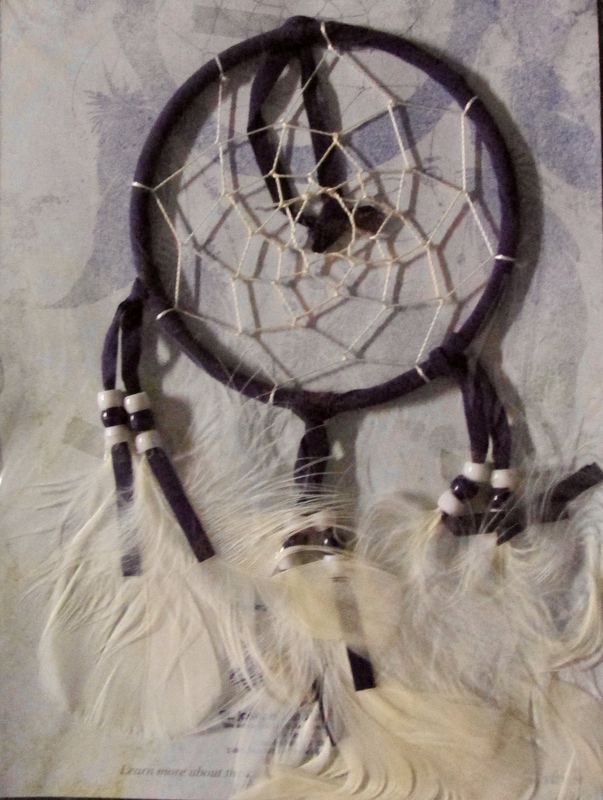 In addition however there was a most unique and unusual item, a genuine facsimile of a Lakota Indian Dream Catcher. 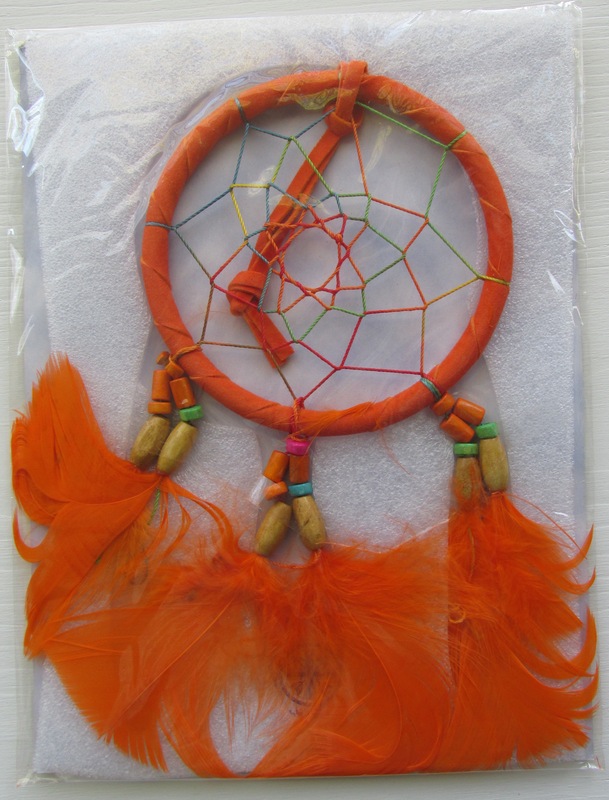 The Dream Catcher is a little hand-made assembly of string net, naugahide, beads and feathers. Mounted on die-cut foam core, it is shrink wrapped with colorful operating instructions ending with: “to be hung on the tipi or lodge and on a baby’s cradle board”. I have to admit, I had to dig through pounds of newspapers and old phone bills to retrieve this package from our recycling bin. There is something especially foreboding about disposing of the St. Joseph’s piece so casually. 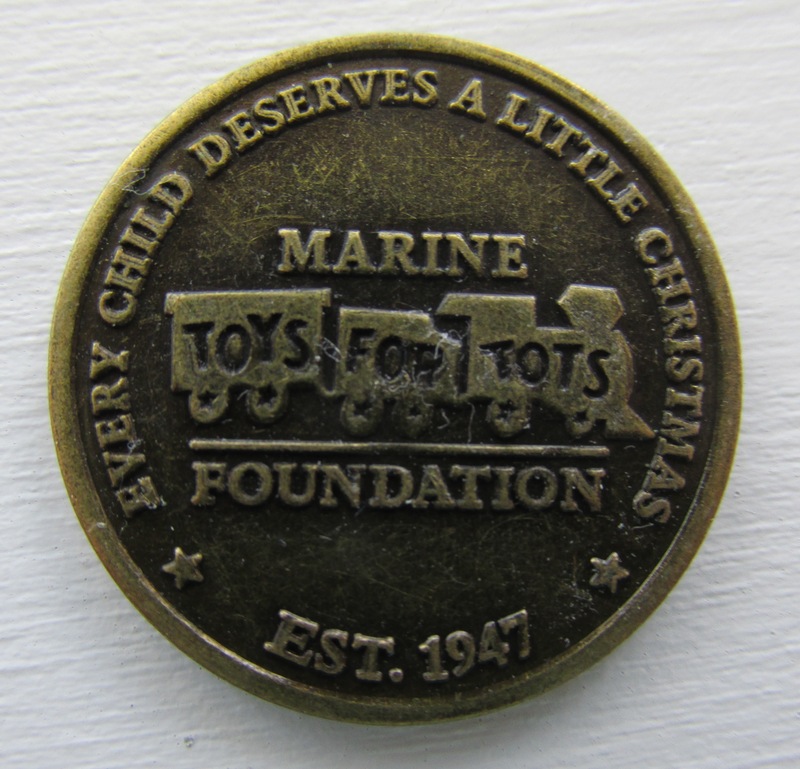 The Marines Toys For Tots medallion, struck with the USMC shield and Semper Fidelis on the other side. Yes, in the past, I have taken all the coins, scribbled on lots of notepads, hung countless calendars, and stuck hundreds of stickers without a moment’s guilt, or nearly so, but the Dream Catcher had me netted and nettled. This one item–which I would never purchase on a dare–clinched the deal. Just how unlucky could my life turn out if I didn’t give due respect? So it’s hanging over my DAV Certificate of Merit. Thanks for reading! I hope you find your charity of choice this season. These organizations are especially effective, and they mind their pennies too. Direct mail: hard to pitch! One of the key benefits of hard copy mail is it is harder to throw away. Unlike emails. So with this thought in mind, take a look at how these marketers deliver the message that can’t be ignored. Father Flanagan sends 7 cards & envelopes to write and mail. Father Flanagan’s Boystown is doubling down on their request at our household after they received a modest donation last fall. This lumpy package delivered 2 notepads, 7 greeting cards, 1 novelty gift bag, and best of all, just like the old Time Life subscription offers, a ball point pen! Not surprisingly, they are asking a minimum of $20 for a gift, which is pretty much what they got last time. Wounded Warrior Project is much simpler in their acquisition package, merely asking for a first time gift of $10. It is a real stamp, and let’s remind you.. Federal property! What is nagging in this kit is their gift of one Purple Heart postage stamp. Paper-clipped to show through the double window, it is impossible to throw away. But could you use it without sending back a donation? March of Dimes seems just like that! The March of Dimes continues its efforts with the symbolic gift of a dime. Pocket the money and start the car? Probably not. 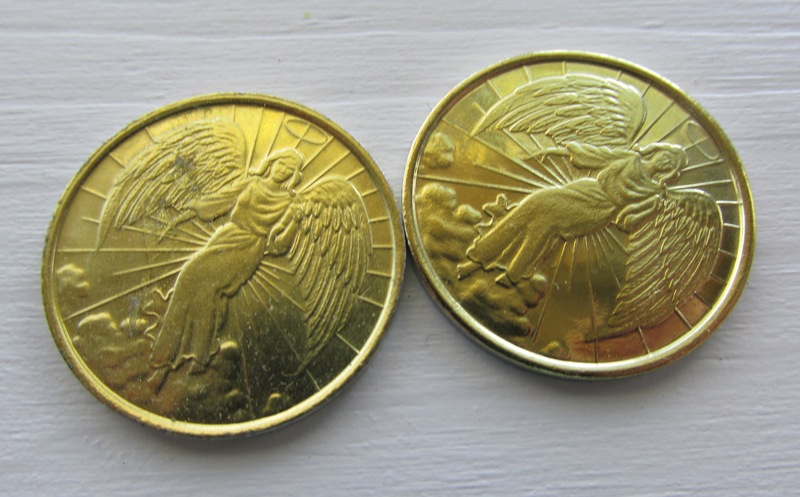 Lastly, and possibly the most insistent in a subtle way is the Catholic Relief Services which have enclosed a quarter-sized brass plated Guardian Angel coin. Unlikely that many will show up in a vending machine any time soon. What fates are you tempting by pocketing this coin, gratis? 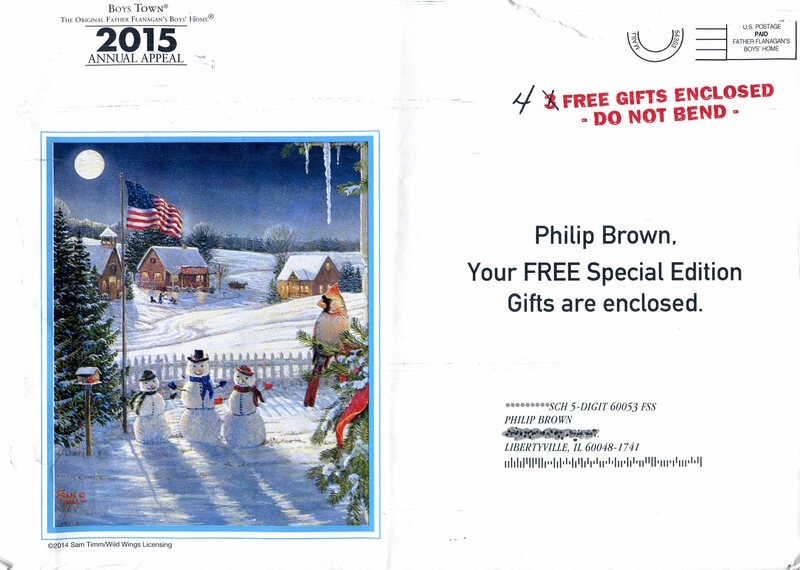 Generally, the public, and more specifically, the digerati generation snicker at direct mail as a past art. Something to view under glass. These marketers can tell you otherwise, and to that end enjoy their day in your mail box. 1. What will you give in return? 2. You have a branded token to remind you. 3. You can’t use the gift without breaking a trust. And for the stingiest curmudgeon, the hardest rogue, the admission: “AAARRRGGHH, I can’t throw the D$$%^^## thing out! And therein is the value of direct mail. 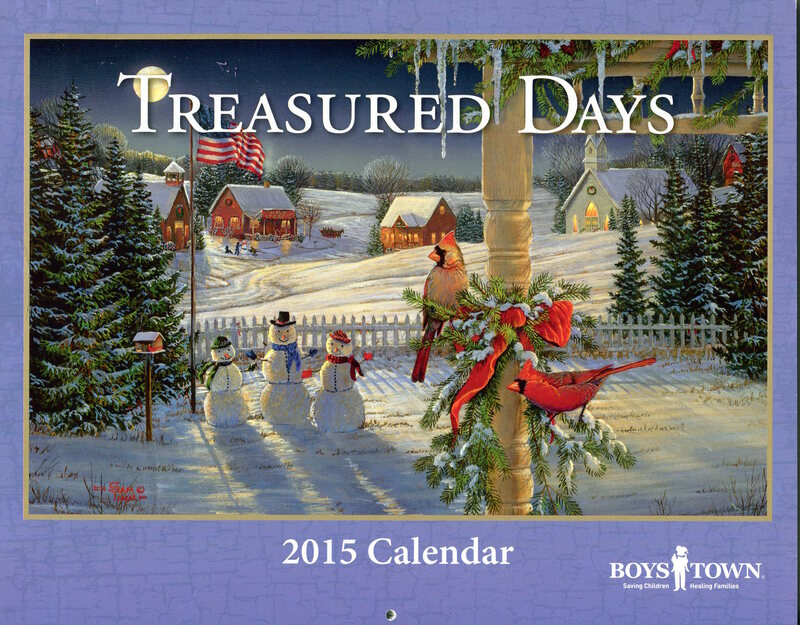 A 24-page color calendar, replete with country roads, cabins, barns, flowers and birds…lots of birds. Personalizing a mail piece comes with expense. You are about to see the motherlode. Gracing the letter with the reader’s name is one thing, but it’s quite another to match that to the envelope. 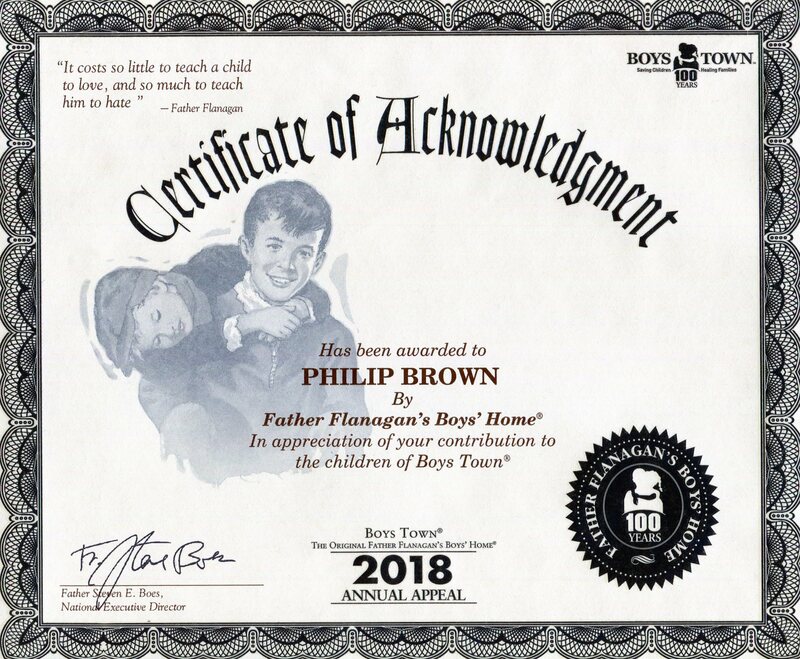 For the fully committed direct marketer, there are personalization payoffs, and Father Flanagan’s Boystown shows us how. An outer envelope promising lots, and delivering, too. 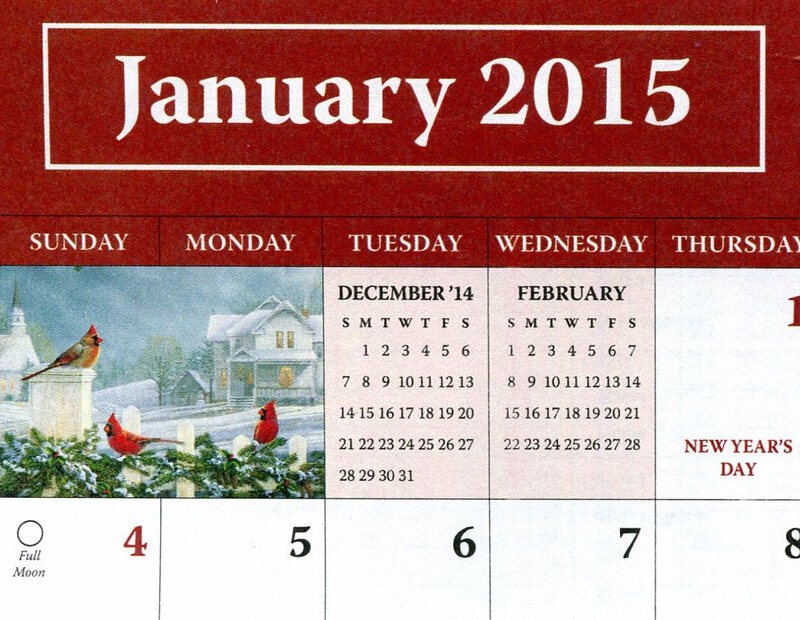 January.. from the 36-pager booklet, with more birds…growing in numbers. 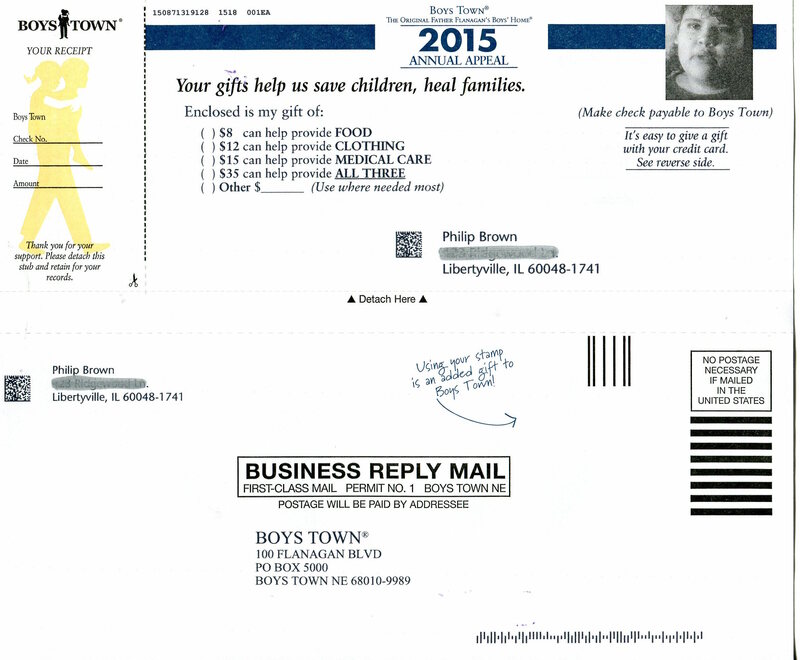 Just before Christmas we received a 9 x 12 envelope from Boystown announcing their 2015 appeal. The donor acquisition kit weighs about a third of a pound, which is huge. The outer envelope calls out, by name, that FREE Special Edition Gifts are enclosed. “Free Gifts” is right. They send three calendars: a 24-page hanger for the wall, a 36-page purse calendar booklet, and an 8-1/4 x 10-3/4 calendar card. The color label sheet. High quality and keepable. The whole collection is covered in Sam Timm nostalgia art: winter ponds, chimneyed log cabins, old trucks, old boats, old canoes and birds…. enough birds to awaken Alfred Hitchcock one last time. 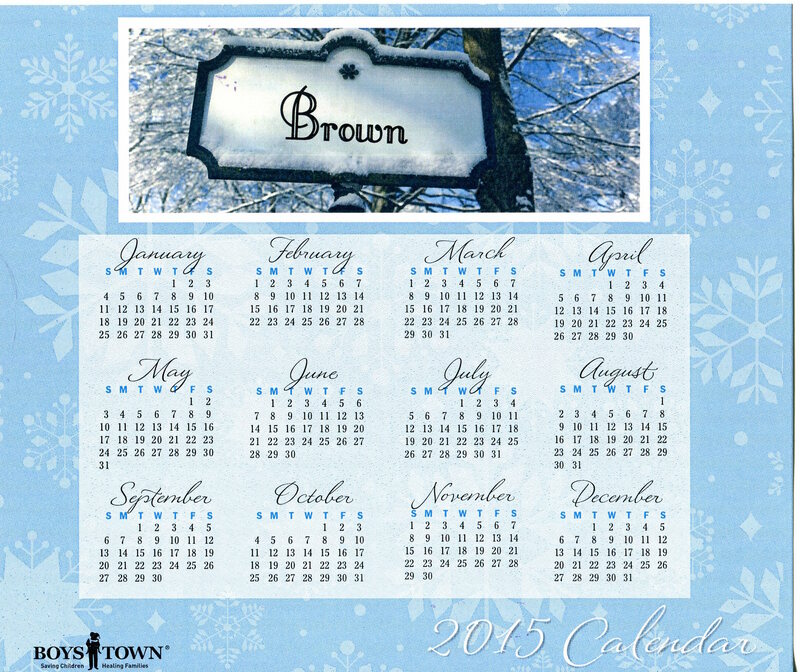 Another calendar, this one with a stylized street sign. But the overwhelming effect comes from the personalization. Father Flanagan has managed to personalize 8 pieces in this whopper kit: the envelope, the letter, the reply form, the reply envelope, two sets of very nice address labels, a certificate and a calendar card. It’s only an acknowledgement, but hey, it’s framable. A Johnson Box, personalized and tinted, captures the gist. Not really. 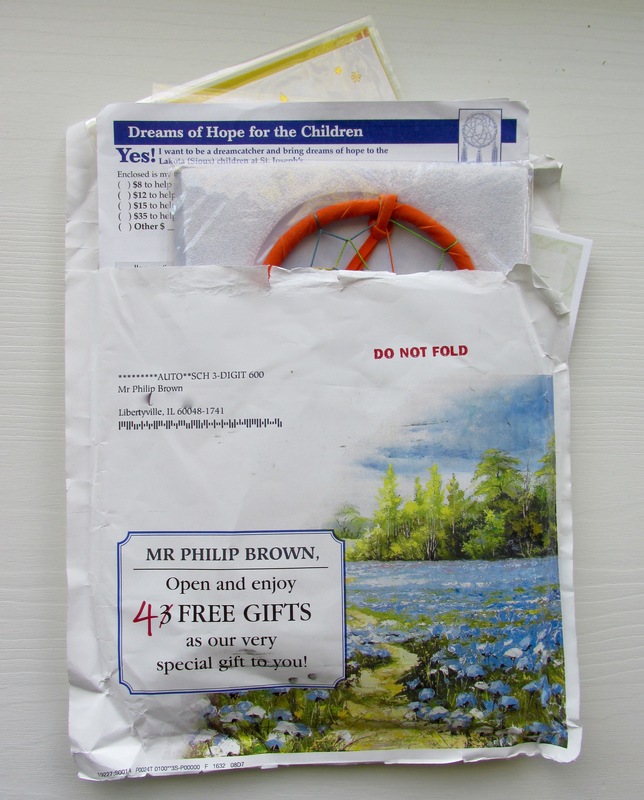 Remember, good direct mail is designed to be indispensable. It is extremely difficult to throw out a kit when your name is woven into its making so admirably. The proof: this is a control package, or very similar to past controls. So it is working. What’s the math that supports this? The kit itself probably cost around $1.80. Postage for a 6-ounce Flat at non profit rates is actually a bargain, add another 30-cents. Total cost in the mail, probably $2.25 after adding list and processing. This is a guess, only, having not spoken directly with Boystown. 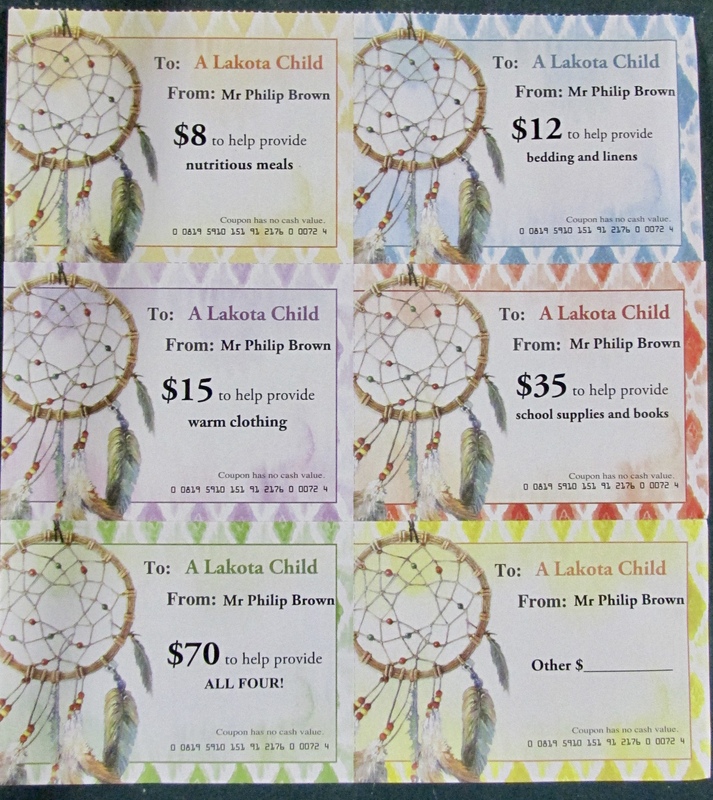 Individualized gift certificates, one of three. And the really hard part: they probably won’t get 15.0% response. More likely, they might achieve 8-10%. Let’s say 10%. So given that, every response came at a cost of $22.50 ($2.25 divided by 10% = $22.50). A strategic gift choice, Goldilocks-style. Let’s go for $15.00! Is a new donor worth $22.50? The answer is, “yes”! By Father Flanagan’s 2012 financial report, they derived nearly $5 for every dollar spent in fundraising. A very acceptable payback according to industry standards. By the numbers above, the new donor will continue to give over time, well in excess of $113.00. A set of stylish B&W labels in case I don’t want to give away the birds. Personalized donor form and reply envelope. Note the QR code for tracking! Again, this analysis is my perspective only, but a donor will continue to give to a worthy cause, especially one as well branded as Boystown. And not only will they give today, but some will most assuredly make bequests after passing to keep the institution providing its valuable service. So personalization plays a big part in winning support, and the savvy marketers at Boystown have done their jobs well in making it pay for their cause. Thanks for hanging in to read all those numbers! FYI, Boystown provided nearly $192 million in services in 2012, and in 2013, served 122,000 children and families across America.